Synopsis: Imagine the worst thing a friend could ever do. One (or more) Sentence Summary: I am sitting here trying to figure out how to put what I think of I Invited Her In into words. This book was not what I expected, in a good way. I couldn't put it down. It frightened me, but I had to keep turning pages. I thought I had the story figured out by the time I got to the second chapter; however, I was clueless all the way to end. If you were a Revenge watcher (TV), you will love this book. I want a sequel. The secrets some people can keep. Mel and Abi were full of secrets (they just kept coming!). Mel and Abi were friends at Uni and drifted apart for 17 years. Abi leaves her husband and shows up on Mel's door. What happens once Abi settles in is crazy good! Mel has a ton of secrets that impact her family and Abi is out for the ultimate revenge when she discovered them. 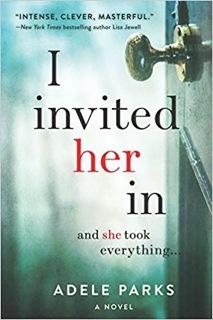 I Invited Her In is a great book with amazing characters and crazy storyline. It is perfect for curling up on the couch or laying in a hammock! You won't want to put it down. Adele’s TLC Book Tours TOUR STOPS: Make sure you stop by the sites on the TLC Book Tours for additional reviews and highlights. Would I Read Other Books by the Author: I believe I would enjoy reading Adele's other books, especially, The Image of You and Game Over. Awesome thoughts. I read this, too and felt the exact same way! I read it through all of Sunday’s Super Bowl and longer! As soon as you compare this to REVENGE, I'm all in. I got sucked into that show on Netflix! But I'm adding this to my list just because of that, thank you for being on this tour!